Do you wave goodbye to your allotment when the winter arrives? One Sunday in early November, I stopped digging, rested on my spade and looked around. Despite being the day of the week most plot holders visit the site, I was alone. There has been a noticeable decline in plot holders tending their plots in recent weeks and I wondered if many people shut up shop on the allotment when the winter sets in? I decided to ask the Twittersphere. Winter is coming! What do you do with the #allotment? Clearly, this isn’t the case for the twittering allotment gardeners. However, when the winter sets in with its cool temperatures, low levels of light and short days, there are many who lock up their sheds and shut down their allotments until spring. I only have to think back to last year when we faced washout conditions on our plot to understand the weather in winter can be unforgiving. However, subject to the weather, there are many good reasons to keep up with the visits to your allotment garden during the winter months. On cold, crisp winter days it’s a beautiful place. The hazy sunshine softens the bleakness of the winter and it can be calm and tranquil. I often stand in silence on the plot and just take it all in. It can also be a productive time. If you plan your allotment effectively, there’s a range of crops to be enjoyed fresh over the winter months. Leeks, Cabbage, Brussels Sprouts and Kale are just some examples. If you haven’t any crops for winter this year, put them in your plan for the season ahead. For me, though, the main reason to keep up with the visits to the allotment over winter is that it provides the opportunity to win time. When spring arrives, there are so many things to do – use the winter to get ahead and prepare the allotment for the start of the growing season. As growth on the allotment slows down, take the time to clear your plot of weeds, waste and any crops that have now finished. If you haven’t already, make a compost area and add all of the organic matter to the pile. Take a look at some sound advice from the RHS on composting. When the winter weather is on your side, take the opportunity to rebuild and repair. Fences, sheds, greenhouses and raised beds might need some TLC. This winter, I’m constructing more raised beds in time for spring planting. If you’ve read my allotment diary, you will know that winter is one of my favourite times of the year on the plot. I’m in my element digging spadefuls of earth on cold days. If the weather is dry, use the time to turn your soil and add as much organic matter as you can get your hands on. The frost will break down the clods of earth to a tilth and kill off any exposed pests that would otherwise shelter away for the winter. Winter is an opportunity to take stock of your tools. Spades, Forks, Trowels and the like should be well cleaned, dried and oiled before being safely stored away for a short rest. If it’s necessary to replace any tools or perhaps you fancy a treat, now is the time to buy. 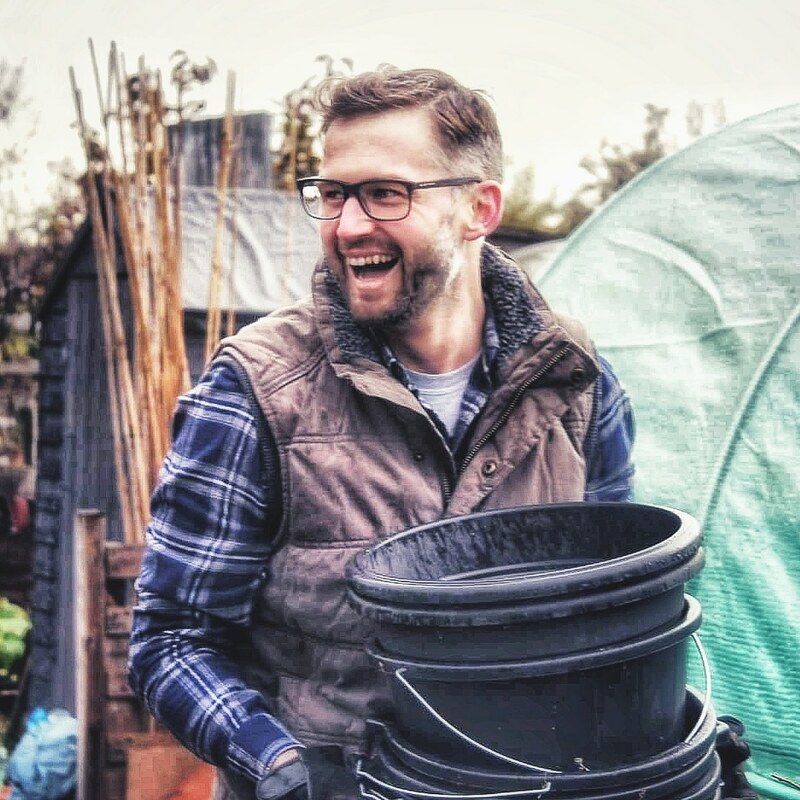 Allotment gardening doesn’t require a shed full of gizmo’s and gadget’s, but there are some fundamentals you should have for the task at hand. Andrew O’Brien is a professional gardener and writes beautiful articles on all manner of gardening related matters on his blog. He’s also very generous when it comes to advice. Take a look at his lowdown on the fundamental tools for all gardeners. As much as we grumble about the cold and wet weather of winter, take the time to consider our wildlife – much of which is a benefit to us in our allotments and gardens. Why not give our birds a hand and get the little helpers involved too. Here’s a simple way make a bird nesting box from the RSPB. You may also like to take the time now to plan a patch to grow some suitable pollinator plants in the new year. It’s a fantastic way to help our declining bee population and join in with some bee-friendly gardening. What are you doing on your allotment and kitchen garden this winter? Do you have any other suggestions? I’d love to hear from you. Drop me a comment below or connect with me on Facebook, Twitter, Instagram and Pinterest. Thanks Chelle! Good to hear from you. I think it’s nice to get ahead as soon as possible when the last of the harvests are being picked. It’s also difficult to get much time at the plot during the winter. Week days are out as its dark when I arrive home. I’m always looking at the weather forecasts for the weekend ahead but that’s about balancing other commitments too. I hope this winter is good to us with the weather. The cultivated half of the plot is in pretty good shape now but I’d love to get some new beds dug in time for spring. I’m a little jealous that your still able to landscape your plot, mines done now I neeed more land to play with!! Aw well what about a change around? Maybe take on another…?? Time is definitely an issue at this time of year, especially if you work full time. My veg patch is in the garden (in fact, my garden is 80% veg patch!) so it’s pretty easy to nip out between the rain showers at the weekends, and warm up with endless cups of tea… but I can understand that’s not so easy if your allotment is not close. I think having an organised allotment, with raised beds like you have, makes it a lot easier. You can just do one at a time, half an hour, and feel like you’ve got somewhere. And a shed with a kettle! if your allowed one on your plot. It’s my first winter on the allotment and I’ve been there today planting tulips in the new cutting patch – a job which would have been easier if the grit bags hadn’t frozen solid! So this post is really helpful to give me ideas for the winter – already planning raised beds, digging and repairing/fitting out the old shed we were left. Plus I feel less like I’m the only one who is on the allotment in the colder months – the last 2 times I’ve been there have only been a couple of others there on a site with 120 allotments! A quiet sunny, frosty morning on the plot.. Couldn’t be happier. I agree with you and I certainly continue to plot over the winter providing the weather is okay. I don’t grow anything at this time of year and having usually done all I need, and want, to do by now my visits there are often fairy short and I mostly potter rather than plotter. I find that doing some forking over or digging out compost certainly helps to keep me warm on colder days. Unless it’s raining I generally go and have have a look round the plot most days even if I can’t do anything. Being retired it gets me out for a while for some welcome exercise and fresh air. Hi Mike. Thanks for the comment. I agree. Sometimes just being on the plot at this time of year is wonderful in itself. I certainly enjoy a bit of digging on the coldest of days. Broken up with mugs of hit tea! Hi Karen. Your are absolutely right. Sometimes it doesn’t feel like it, but spring arrives quickly and we curse ourselves for not doing the jobs we should have done.